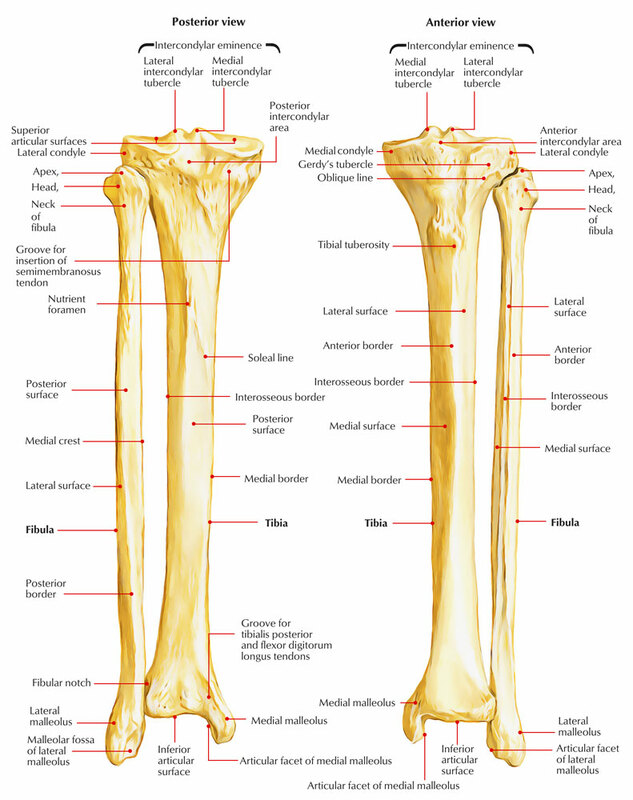 The Tibia is the second largest bone within the body situated on the medial side in the leg. The tibia is the pre-axial bone and homologous with the lateral bone of the forearm, the radius. It carries weight of the body from femur to the foot. The tibia is a long bone and is composed of 3 parts: upper end, lower end, and interceding shaft. The upper end is enlarged and bears notable medial and lateral condyles and tibial tuberosity. The medial condyle is bigger in relation to the lateral condyle. Both condyles articulate together with the condyle of the femur. The shaft has 3 edges- anterior, medial, and lateral; and 3 surfaces- medial, lateral, and posterior. The anterior border is the sharpest and takes a sinuous course from the tibial tuberosity and becomes constant below with the anterior border of the medial malleolus. The lower end is small and projects medially and inferiorly as medial malleolus. Its increased end with condyles faces upward. Its tibial tuberosity and sharp sinuous anterior border of the shaft faces anteriorly. Medial malleolus is really on the medial side. 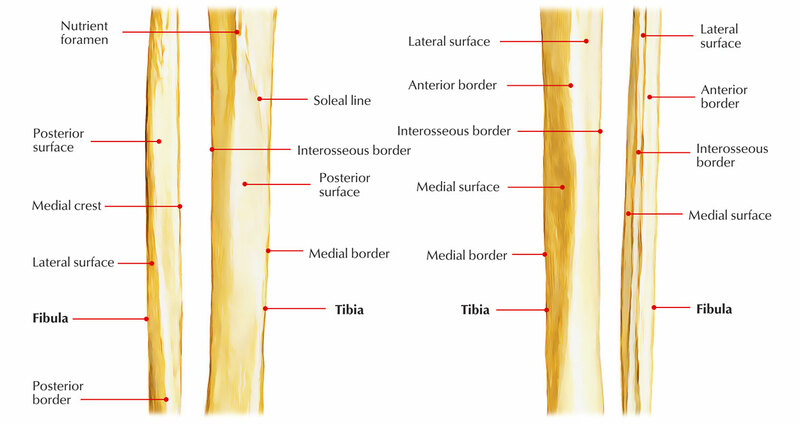 Superior surface of the upper end (tibial plateau) is located in a horizontal plane. The upper end of the tibia is markedly expanded from side to side, to form two large condyles which overhang the posterior surface of the shaft. The upper end includes: (a) a medial condyle, (b) a lateral condyle, (c) an intercondylar area, and (d) a tuberosity. Medial condyle is larger than the lateral condyle. Its superior surface articulates with the medial condyle of the femur. The articular surface is oval and its long axis is anteroposterior. The central part of the surface is slightly concave and comes into direct contact with the femoral condyle. The peripheral part is flat and is separated from the femoral condyle by the medial meniscus. The lateral margin of the articular surface is raised to cover the medial intercondylar tubercle. The posterior surface of the medial condyle has a groove. The anterior and medial surfaces are marked by numerous vascular foramina. It’s bigger in relation to the lateral condyle and presents 4 surfaces: superior, posterior, anterior, and medial. It’s a smooth oval articular surface which articulates with the femoral condyle. It’s somewhat concave in the middle and flattened in the periphery. The peripheral flattened part is covered by the fibrocartilaginous plate, the medial meniscus. It presents a deep transverse groove for the insertion of tendon of semimembranosus. The anterior and medial surfaces are marked by the vascular foramina and adjoining margin gives connection to the medial patellar retinaculum. The lateral condyle overhangs the shaft more than the medial condyle. The superior surface of the condyle articulates with the lateral condyle of the femur. The articular surface is nearly circular. As in the case of the medial condyle, the central part is slightly concave and comes in direct contact with the femur, but the peripheral part is flat and is separated from the femur by the lateral meniscus. The articular surface has a raised medial margin which covers the lateral intercondylar tubercle. posterior surface of the condyle is marked by a groove. The anterior aspect of the condyle bears a flattened impression. It presents a circular articular surface for articulation together with the lateral femoral condyle. It’s somewhat concave in the middle and flattened in the periphery. The flattened peripheral part is covered by a plate of fibrocartilage- the lateral meniscus. Inferolaterally this surface presents a circular smooth articular facet for the head of fibula. Between the articular facet for the fibula and the margin of superior surface there’s a shallow groove for the tendon of popliteus. The anterior surface has a flat triangular facet for the connection of the iliotibial tract. Anterior and lateral surfaces supply connection to the lateral patellar retinaculum. 1. It’s the rough area on the superior surface of the upper end of tibia between the articular surfaces of 2 condyles. 2. The middle of intercondylar area is narrow and marked by an elevation referred to as intercondylar eminence. The medial and lateral parts of the eminence are more notable and represent the medial and lateral intercondylar tubercles. Anterior horn of Medial meniscus. Anterior horn of Lateral meniscus. Posterior horn of Lateral meniscus. Posterior horn of Medial meniscus. Mnemonic: Medical College London, London Medical College. It’s a projection in the apex of rough triangular area situated on the anterior aspect upper end of the tibia. It’s split into an upper smooth and a lower rough part. Upper smooth part gives connection to the ligamentum patellae. Lower rough part is linked to the subcutaneous infrapatellar bursa which divides it from the skin. Rough triangular area above the tuberosity is linked to the deep infrapatellar bursa. The shaft of the tibia is prismoid in shape. It has three borders, anterior, medial and interosseous; and three surfaces, lateral, medial and posterior. he anterior border is sharp and S-shaped being convex medially in the upper part and convex laterally in the lower part. It extends from the tibial tuberosity above to the anterior border of the medial malleolus below. It is subcutaneous and forms the shin. The medial border is rounded. It extends from the medial condyle, above, to the posterior border of the medial malleolus, below. The interosseous or lateral border extends from the lateral condyle a little below and in front of the fibular facet, to the anterior border of the fibular notch. It’s the sharpest, subcutaneous, and sinuous in course. It goes from the tibial tuberosity to the anterior border of medial malleolus. It stretches from the medial condyle to the posterior border of medial malleolus. The soleal line joins the medial border in the junction of its upper one-third with the lower two-third. It’s sharp and goes from the lateral condyle below the facet for the head of fibula to the anterior border of fibular notch. It gives connection to the interosseous membrane which connects the tibia and fibula. Its distal part breaks up to enclose a triangular notch for the connection of interosseous inferior tibiofibular ligament. The lateral surface lies between the anterior and interosseous borders. In its upper three-fourths, it is concave and is directed laterally, and in its lower one-fourth it is directed forwards. The medial surface lies between the anterior and medial borders. It is broad, and most of it is subcutaneous. The posterior surface lies between the medial and interosseous borders. It is widest in its upper part. This part is crossed obliquely by a rough ridge called the soleal line. The soleal line begins just behind the fibular facet, runs downwards and medially, and terminates by joining the medial border at the junction of its upper and middle thirds. Above the soleal line, the posterior surface is in the form of a triangular area. The area below the soleal line is elongated. It is divided into medial and lateral parts by a vertical ridge. A nutrient foramen is situated near the upper end of this ridge. It is directed downwards and transmits the nutrient artery which is a branch of the posterior tibial artery. It faces anteromedially and is located between the anterior and medial edges. It’s just about solely subcutaneous. Its upper part near the medial border gets insertions of 3 muscles. From before backwards, these are: sartorius, gracilis, and semitendinosus. Mnemonic: Girl between 2 surgeons ‘SGS’. It’s directed anterolaterally and is located between anterior and interosseous edges. Its uppertwo-third gives origin to the tibialis anterior. (d) Deep peroneal nerve/anterior tibial nerve. Mnemonic: The Himalayas Are Not Dry Dry Plateaus. It is located between the medial and lateral edges. The posterior surface of the tibial shaft is subdivided by the soleal line into an upper small triangular area and a lower large area. A triangular area above the soleal line gives insertion to popliteus. A large area below the soleal line is split into a medial and a lateral part by a vertical ridge. The nutritional foramen of the tibia is situated at the upper end of the vertical ridge. Alimentary canal is pointed downward. The nutrient artery is a branch of the posterior tibial artery and the largest nutrient artery of the body. The flexor digitorum longus originates from the medial area below the soleal line. The tibialis posterior originates from the lateral area below the soleal line. Mnemonic: The Doctors Are Not Hunters. The lower end of the tibia is slightly expanded. It has five surfaces. Medially, it is prolonged downwards as the medial malleolus. The anterior surface of the lower end has an upper smooth part, and a lower rough and grooved part. The medial surface is subcutaneous and is continuous with the medial surface of the medial malleolus. 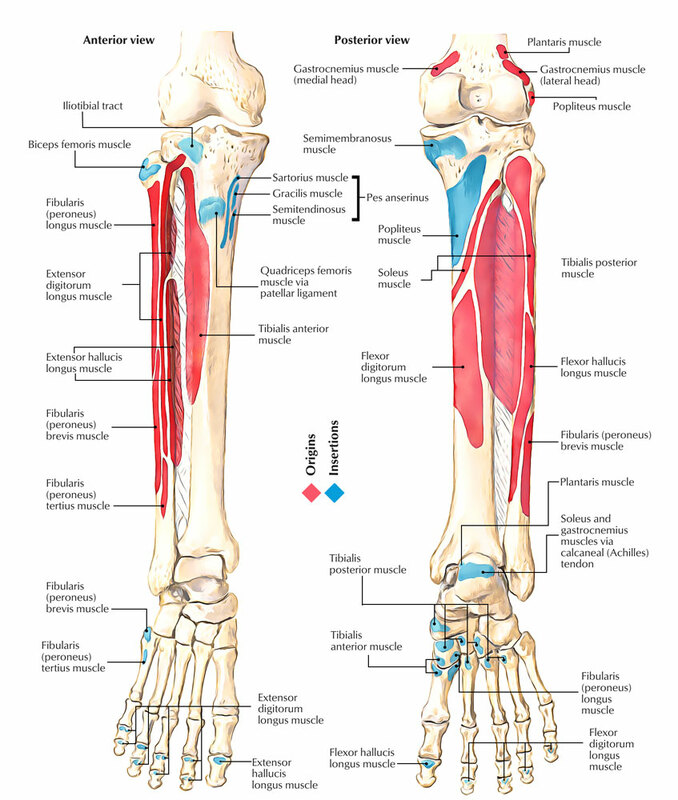 The lateral aspect of the lower end presents a triangular fibular notch to which the lower end of the fibula is attached. The upper part of the notch is rough. The lower part is smooth and may be covered with hyaline cartilage. The inferior surface of the lower end is articular. It articulates with the superior trochlear surface of the talus and thus takes part in forming the ankle joint. Medially the articular surface extends on to the medial malleolus. The medial malleolus is a short but strong process which projects downwards from the medial surface of the lower end of the tibia. It forms a subcutaneous prominence on the medial side of the ankle. The lower end presents 5 surfaces (anterior, posterior, medial, lateral, and inferior) and a downward projection from the medial part, the medial malleolus. Anterior surface has an upper smooth and featureless part and lower rough and grooved part. Posterior surface in its medial part presents a groove for the tendon of tibialis posterior. Medial surface is subcutaneous and is constant with the medial surface of the medial malleolus. Lateral surface presents a fibular notch. Anterior and posterior margins of the fibular notch supply connection to anterior and posterior tibiofibular ligaments. The upper part of the fibular notch is rough and gives attachments to the interosseous tibiofibular ligament. Inferior surface is smooth and articulates with the body of the talus. Its tip is located at a higher level than that of the lateral malleolus and gives connection to the deltoid ligament. Its lateral surfaces present a comma-shaped articular facet for articulation together with the quite similar facet on the medial outermost layer of the body of the talus. Its posterior surface presents a vertical groove for the tendon of tibialis posterior. Medial margin of the groove is notable and gives connection to the flexor retinaculum. At the upper end, the capsule is connected to the margins of tibial condyles medially, laterally, and posteriorly. Anteriorly it’s connected to the sides of triangular area on the anterior aspect of condyles combining with all the medial and lateral patellar retinacula and to the tibial tubercle where it combines with the ligamentum patellae. Behind the lateral condyle, the capsule is deficient for the passage of tendon of popliteus. At the lower end, the capsule is connected to the margins of articular surfaces where it goes on to the lower end of fibula. The tibia ossifies from 3 centers- 1 primary and 2 secondary. 1. Primary center appears in the middle of shaft in the age of seventh week of IUL. Look: At birth or soon after beginning. Fusion with all the shaft 18 years. The upper epiphysis goes anteriorly as a tongue like process to create the upper part of tibial tuberosity. 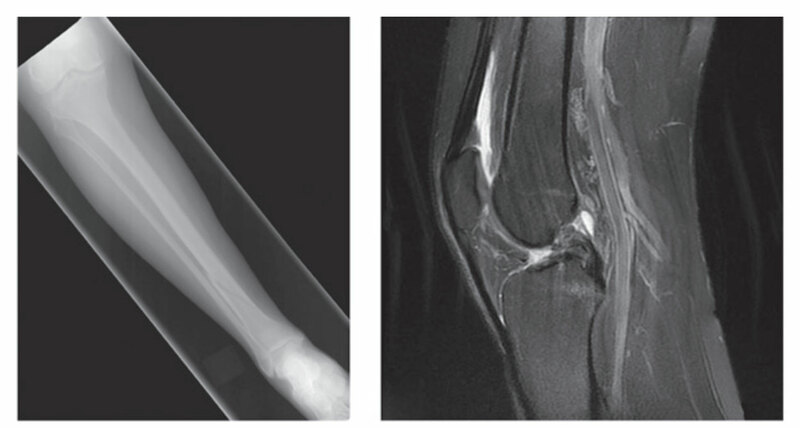 The upper end of tibia is the commonest site of acute osteomyelitis, but knee joint stay unaffected since the capsule of knee joint is connected near to the margins of articular surfaces proximal to the epiphyseal line. The tibia is normally fractured in the junction of upper 2/3rd and lower 1/3rd of its shaft. (The tibial shaft is narrowest at the junction of upper two-third and lower two-third, therefore the commonest site of fracture.). The lower two-third of the tibial shaft is empty area (thus devoid of any muscular connection) and have low blood supply; for this motive, the fractures in the lower 1/3rd of the shaft of tibia show delayed union or non union.